Musical celebrities were all over Cannes this year, but only Jay-Z is actually picking up hardware. The Titanium Lion was launched in 2003 to recognize emerging forms of brand work that wouldn’t neatly fit into the existing award categories; the Integrated Lion was added in 2005, though the definition of what falls under each title has been fluid. Jury chair Bob Scarpelli, the chairman of DDB Worldwide, acknowledged that the definition of an integrated campaign has shifted and that today, “the best ideas are integrated into culture.” Scarpelli called the campaign, which has also picked up Grand Prix in the Outdoor and Film Craft categories, “bold, innovative, interactive, immersive. It’s creating media.” There was no Titanium Grand Prix awarded. 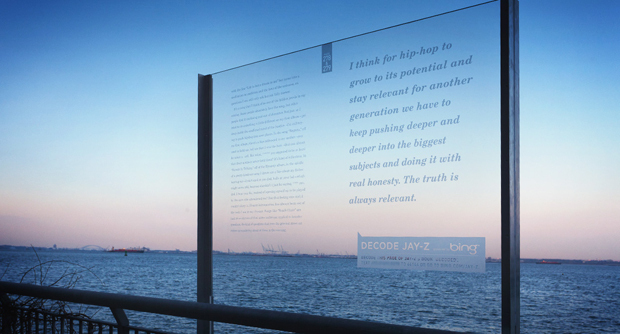 The “Decoded” campaign saw every page from Jay-Z’s memoir placed in real-world locations. Read more about the campaign here. There were two other Titanium Lion winners — the “American Rom” campaign from McCann Erickson Bucharest, which also captured the Promo/Activation and Direct Grand Prix, and Volkswagen’s “Speed Camera Lottery” from DDB Sweden. “Speed Camera Lottery” came out of DDB Stockholm’s much-awarded “Fun Theory” campaign for VW. The campaign revolved around the premise that people would do the right thing if only that thing was a little more fun. So the agency starting doing things like making subway staircases into piano keys, and modding garbage bins so that each trash deposit resulted in a cartoonish sound effect. The initiative also included a contest challenging consumers to come up with their own fun theory ideas. The winner was American Kevin Richardson, whose idea was to use speed trap cameras at intersections to reward drivers who stayed under the posted limit. Safe drivers had the chance to win a lottery funded by the fines of speeders. The idea was put into place (temporarily) in Stockholm. The popular Old Spice “The Man Your Man Could Smell Like” effort, which included the “Responses” campaign, won one of three Gold Integrated Lions.